For recording musicians setting up a computer-based studio, the problem of finding a high-quality audio interface is pretty much a thing of the past. The difficult thing now is deciding which one of the many products, each with their own combination of features, best suits your needs and budget. Alesis have recently added to this problem with the I/O series of Firewire-based audio/MIDI interfaces. The I/O2 and I/O14 (described briefly in the 'Keeping It In The Family' box) are the baby brothers to the I/O26 reviewed here and, while the amount of connectivity provided increases through the range, the units obviously share some common technology and design elements. In summary, the I/O26 offers 26 inputs (eight analogue, 16 ADAT and two via S/PDIF) and eight simultaneous outputs (all analogue, while the S/PDIF output can be assigned to replicate any of the analogue output pairs). Sample rates of up to 192kHz are supported, all at 24-bit. All eight analogue inputs feature switchable phantom power, and two headphone outputs and MIDI In and Out are also featured. More uniquely, the I/O26 also includes dedicated turntable inputs and insert points on every analogue input. Aside from the driver and mixer software (described below), Cubase LE is also included in the price and would make a perfectly respectable starting point for those taking their first steps in computer-based recording. So if you are currently struggling to make a choice between the large number of multi-channel audio interfaces that are now available, have Alesis made that choice easier or more difficult with the I/O26? Aside from the unit itself, the I/O26 box includes a printed manual, a software/driver installation CD, a Firewire lead and a power supply. When using the I/O26 with a four-pin Firewire port (for example, on a laptop), an external power source is required, but with a six-pin Firewire port the I/O26 is fully bus-powered. Perhaps the first thing that struck me on opening the packaging was how sturdy this unit is. MOTU's Ultralite has a reputation for solid construction and, to my mind at least, the Alesis I/O26 is on a par with that. While it is not the most compact Firewire interface that you might buy, I'd have no qualms about taking the I/O26 out of the studio. I didn't do any 'drop' tests with the review unit (! ), but I imagine it would be capable of withstanding the usual bumps and bashes that are an inevitable part of music on the move. The I/O26's Hardware Direct Monitoring software provides straightforward acccess to a variety of functions and offers much more precise metering than the five-stage LEDs on the unit's front panel. The top panel appears uncluttered and well laid out. All eight analogue inputs feature combi-jack sockets that can be used with XLRs or quarter-inch jacks. Gain for all analogue input channels is controlled by a large dedicated knob beneath each input jack and, whatever mode the input is being used in, there seems to be plenty of gain available to accommodate a wide range of source signal levels. Also welcome are the five-segment LED input level meters. As I'll explain later, more detailed level metering is provided by the software supplied with the I/O26, but the physical metering supplied here will be adequate for most users and is significantly better than that found on many compact audio interfaces. Channels one and two also provide an option to switch between mic and line level and a high-impedance circuit suitable for direct recording of a standard electric guitar or bass. In addition, channels seven and eight feature a switch for selecting between mic/line level and a 'phono' setting. Engaging the latter disables the top panel inputs for these channels and allows a turntable to be connected directly to specific phono inputs located on the rear of the unit. These preamps have a higher gain and EQ properties that are tailored for the output from a turntable. While this might not be a key selling feature of the I/O26, it is unusual and would most certainly appeal to those who use turntables as part of their instrument repertoire. In addition to some useful status LEDs (showing sample rate and activity on the digital inputs) and the meters showing the level on the main outputs, the centre strip of the top panel contains four small buttons at the top and four further knobs. The former switch the phantom power on and off for each pair of input channels. The upper two knobs are separate volume controls for the two headphone outputs, while the lower two comprise a main output-level control (very welcome) and a 'blend' control; the latter provides an easy way to balance between audio being provided from the host DAW and any sources being directly monitored via the I/O26's various inputs, and is a useful addition. However, for anyone who likes to use external hardware while recording, perhaps the biggest plus point is the insert jacks located beneath the combi-jacks on every analogue input channel. In terms of the signal chain, these are placed after the input preamp but prior to the D-A conversion, which is ideal if you want to patch in a hardware compressor or EQ while tracking. Usefully, the manual also demonstrates how the inserts can be used to enable the I/O26 to act as a series of preamps for an external recorder and how to bypass the I/O26 preamps if you want to use a high-end preamp and route the signal to your DAW via the I/O26. The rear panel is a little busier but also well organised. Two headphone jacks and eight balanced outputs dominate the right-hand side, while the turntable phono inputs, ADAT, S/PDIF and MIDI connectivity occupy the centre area. Two Firewire connectors and the power connector round off the rear panel. 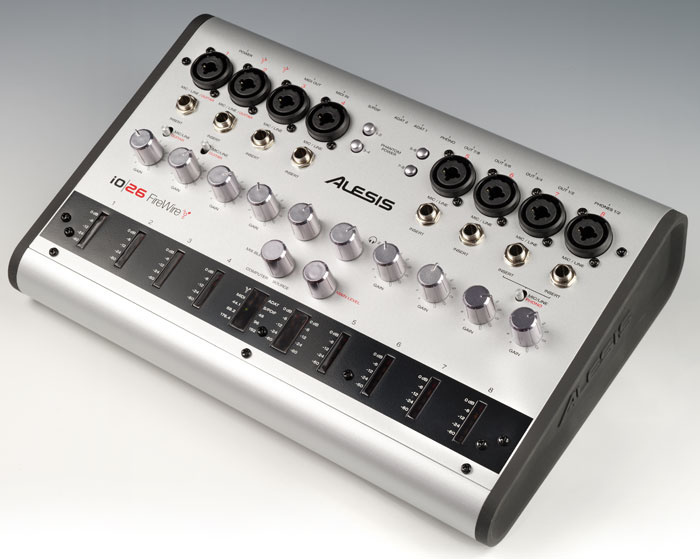 The I/O26 is part of a larger Alesis family, and if you don't need the eight-in/eight-out analogue format, the smaller and cheaper I/O2 or I/O14 might appeal. The I/O2 (£139) provides two ins and two outs, while the I/O14 (£259), which looks a little like an I/O26 that someone has cut in half, is four-in/two-out. Both offer S/PDIF I/O, MIDI I/O, phantom power, Cubase LE, solid construction and those useful insert points. While the I/O14 supports sample rates up to 192kHz, the I/O2 only goes up to 48kHz. Those with a little more cash to splash might also consider the Alesis I/O Control or the Master Control units. These feature much of the same I/O technology as the I/O series but are mounted into a control surface that can be used to provide hands-on control of your DAW. Installation of the drivers and Alesis Hardware Direct Monitoring (HDM) software, and the subsequent connection of the hardware to my test PC, proceeded without any problems. A quick check of the Alesis web site revealed both updated software (v1.0.2.00) and firmware (v1.06) for the unit, and both were easily downloaded and installed. The Control Panel dialogue provides access to a range of key settings, including the buffer size and sample rate. There were some minor differences between the printed manual description of the Control Panel and the latest version of the software but nothing that would cause any significant confusion. 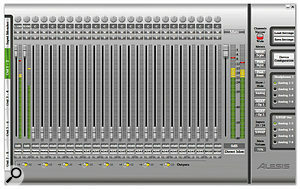 The Hardware Direct Monitoring software provides the usual virtual mixing environment. Tabs down the left edge allow the user to toggle between displaying the input channel meters and separate mixer panels for each of the analogue output pairs. These are separate mixes, so it would be possible to provide different monitor mixes via the different output pairs if you so wished. A nice touch is that the second headphone output can be switched to receive a feed from any of the four output pairs; very useful if the engineer needs one mix while running a session but whoever is being recorded wants a different balance in their ears. 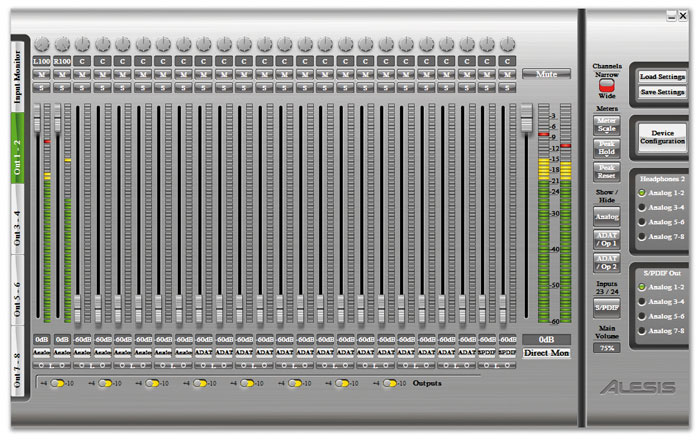 The mixer view can be switched between a narrow and a wide display, and it is also possible to hide groups of unused channels. Mixer settings can be saved for later recall and channel names can also be edited. Should you wish, direct monitoring can also be disabled if you want to monitor via your DAW. I'd hesitate to describe the HDM application as the prettiest piece of software I've ever used, but overall it does its job in a functional fashion, and the metering is much more detailed than that provided on the hardware front panel. Given the Alesis badge, it almost goes without saying that the audio performance of the I/O26 is very good — but I'll say it anyway. My usual subjective listening tests, using a range of commercial recordings covering everything from orchestral styles through to contemporary R&B, demonstrated that the I/O26 coped admirably with anything I cared to play back through it. The stereo imaging appeared to be very good, the bass end was full and there was plenty of detail at the top end. The headphone outputs performed equally well, and while I didn't do any detailed blind testing I found little to choose between the I/O26 and my own TC Electronic Konnekt 24D interface, with the exception that the Alesis unit seemed to have a little more output gain to play with. Recording via the analogue inputs proved to be an equally happy process, whether using a line-level signal, DI'ing a guitar or recording a vocal or acoustic guitar part via a decent condenser microphone. Recordings were clean and clear and, in the majority of home or project studios, I'd be surprised if the I/O26 proved to be the weak link in terms of audio quality. All these subjective observations were backed up with a set of more objective tests via Steinberg's Wavelab and Right Mark's Audio Analyzer. As might be expected, the exact figures varied somewhat with the different bit-depth and sample rate selected and depending upon which inputs were used. However, using the line-level connections at 24-bit, 44.1kHz, I was able to measure a signal-to-noise ratio of well over 100 dB(A) and a total harmonic distortion of around 0.002 percent. Yes, you might get better absolute figures from a more expensive interface but, providing due care and attention is paid to the rest of the signal chain, I'd have no reservations about using the I/O26 for serious recording tasks. While I did the bulk of my testing with Cubase on my desktop PC, I also did some brief experiments with the I/O26 using a PC laptop and a range of other audio applications. In all cases, the I/O26 seemed to perform very solidly and I had no problems with Acid Pro, Sound Forge, Wavelab or Sonar. In my more extended testing within Cubase, I was also impressed with the drivers. Even fairly busy mixes (including the various demo projects supplied with Cubase 4) played back smoothly with a sensible buffer size of 256 samples: the system never showed any sign of strain and playback was entirely glitch-free. Overall, the I/O26 gave me the impression of being a very reliable, 'no fuss' piece of equipment. The MIDI and S/PDIF connectivity worked as expected, but more intriguing were the rear-panel phono inputs for use with a turntable. I only had my humble (dusty and ageing) domestic turntable with which to try this. That said, the results were good — including the hiss and crackle! — so the I/O26 provides a simple way to lift samples from vinyl or transfer a few favourite LPs onto CD. These inputs are perhaps not a major selling point, but they are a nice detail. However, if the I/O26 has a distinct feature that sets it apart from the majority of other multi-channel audio interfaces, it is the dedicated insert points. Inserts are an integral part of any serious hardware mixer, and their absence from most computer-orientated audio interfaces can make patching in your favourite hardware compressor or EQ a bit of a chore. With the I/O26, that problem disappears and, while the trade-off is a somewhat bigger footprint than some of the eight-in/eight-out competition, I suspect that those with access to high-quality outboard processors will find the insert points a very attractive proposition indeed. In terms of their operation, there is little to say about the inserts; they work as advertised and, like the rest of the I/O26, with a minimum of fuss. With so many well-specified options available, the exact feature set of a particular interface model is obviously going to be a critical part of any purchase decision. The I/O26 has the 'eight-in/eight-out plus digital I/O' boxes well ticked, but it has enough additional features to give it a distinctive appeal. Top of the list here would be the insert points, which make patching in external hardware a breeze, but other advantages include the dedicated turntable input, the very robust construction and the no-fuss operation. Overall, there is very little not to like about the Alesis I/O26. At this price, and in terms of audio quality, it is certainly able to compete with the slew of other multi-channel audio interfaces that are currently available. If this mid-level price point is where your budget lies, the I/O26 is highly recommended and most certainly worth auditioning alongside the competition. Insert points will be welcome for those wanting to patch in outboard processors. The Alesis I/O26 is a very competent multi-channel audio/MIDI interface whose insert points and robust construction give it a distinctive appeal. The audio quality will be more than a match for most home or budget project studios. Highly recommended.